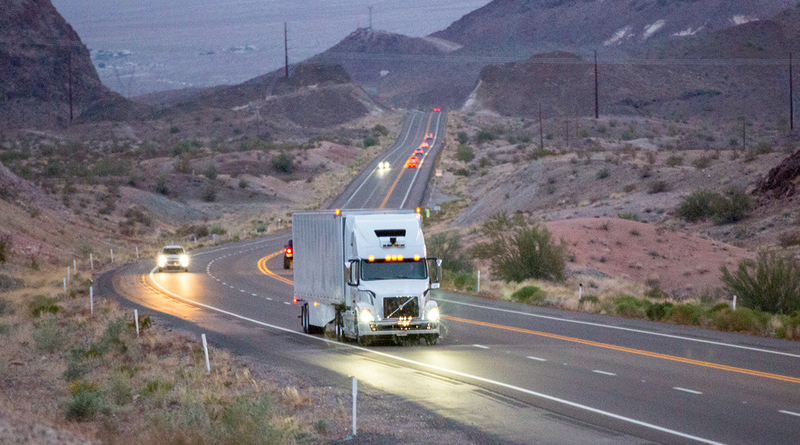 Uber Technologies Inc. announced that its self-driving commercial trucks are now conducting regular freight hauls in Arizona through the Uber Freight network. Automated trucks operated by Uber’s Advanced Technologies Group are moving loads across the state in both directions on Interstate 40 and exchanging trailers with conventional trucks in multistage shipments coordinated via the Uber Freight application. Uber said its self-driving trucks are hauling consumer products in dry van trailers, but declined to name which shippers are using its services. With these operations, Uber said it is beginning to build a freight system in which longhaul autonomous trucks work in tandem with shorthaul drivers to move shipments more efficiently. Alden Woodrow, product lead for Uber ATG’s self-driving truck business, said the company’s automated freight deliveries in Arizona represent a “big step forward” from hauling a single load in one direction, as it did in 2016 with its landmark delivery of a load of beer for Anheuser-Busch in Colorado. Now Uber ATG is working to establish a more complete business model that begins to unlock the potential for automated trucks to save lives and improve freight efficiency and drivers’ livelihoods, Woodrow said. Uber intends to accelerate the deployment of driverless trucks by limiting them to highway operation, while continuing to rely on skilled drivers to handle the more complex driving tasks at the beginning and end of each trip. To make that possible, Uber ATG is creating transfer hubs where self-driving and human-driven trucks will exchange their loads. The company highlighted a recent example where a driver based in Los Angeles booked a nearby load on Uber Freight in the morning and hauled it to Topock, Ariz., where he swapped trailers with a self-driving truck, then returned with his new load and made it home in time for dinner. Uber believes these types of freight transfers eventually will happen across the country. Currently, Uber is using the Arizona Department of Transportation’s Topock port of entry at the border with California as the drop yard for its trailer handoffs. Woodrow said that location is giving law enforcement and regulators an opportunity to observe Uber’s self-driving trucks and learn more about the technology, but added that the company eventually will need more dedicated facilities to serve as transfer hubs as it expands its operations. Today, Uber ATG’s self-driving trucks still have a trained driver sitting behind the wheel at all times, but the company is working to further refine its technology to the point where its autonomous trucks can operate on highways with no driver at all. “We are focused on a system where we can safely take the driver out of the vehicle altogether,” Woodrow said, but acknowledged that Uber still has “a lot more work to do” before it can commercially launch such a system. He also reiterated Uber’s argument that longhaul driverless trucks using the transfer-hub model would not displace truck drivers, but gradually shift driving jobs from longhaul routes to more desirable shorthaul jobs that provide them with more home time. While moving freight along I-40, Uber ATG’s trucks also will generate data that can help the company move closer to launching a commercial product for self-driving trucks, Woodrow said. At the same time, the freight moving in and out of Uber’s transfer hubs could create more load opportunities for drivers using the Uber Freight app. This model can support the company’s efforts to help drivers find desirable loads and enable them to be home as often as they’d like, said Eric Berdinis, product manager for Uber Freight. The Uber Freight platform is designed to connect carriers with available loads that meet their requirements while streamlining the booking process. Drivers can use the mobile app to book loads with upfront pricing and receive full payment in a few days. Uber’s deployment of its self-driving trucks for real freight deliveries within its Uber Freight platform mirrors the company’s strategy in its core ride-hailing business. The technology firm has been providing Uber rides on passenger vehicles equipped with its self-driving system in Pittsburgh and Phoenix. Outside Arizona, Uber also is running its self-driving trucks on highways near its San Francisco headquarters and occasionally tests them near its Pittsburgh office as well.